Hey everyone! Long time! I’ve been writing a lot on my other blog though. 🙂 Just haven’t really been cooking. I’m going to get back into the swing of things though and hopefully I’ll be cooking more. 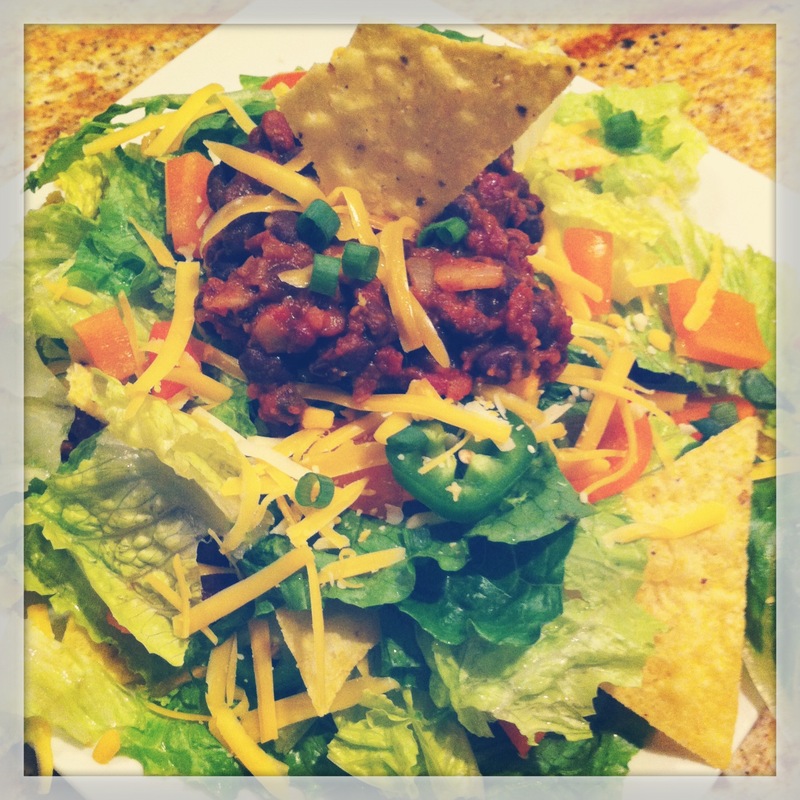 Anyways, today I made a really delicious (and easy) taco salad for dinner. I was inspired by a taco salad that Sean’s step-mother makes, but she wasn’t available to give us the recipe so we winged it. 1 can of aduki beans, rinsed. 1 can of black beans, rinsed. 1 tsp of chipotle chili powder. 1 tsp of crushed red pepper flakes. 1 1/2 romaine heart lettuce, rinsed and ripped coarsely. green onion, chopped (as much as you’d like). shredded cheddar cheese (any amount you want). nacho chips (as much as you’d like). Heat pan on medium-low heat. Once your pan is heated, add a tsp of olive oil. Saute onions until they are almost translucent. Add your garlic to the pan and cook for 2-3 minutes. Incorporate the taco seasoning to the onion and garlic mixture. Add your beans (aduki and black beans). Mash slightly and mix well. Add the chili powder, crushed red pepper flakes, and salsa to the mixture. Mix well. Keep in pan until heated through. While your bean mixture is cooking, assemble your salad! Layer nacho chips, lettuce, pepper, jalopenos, and cheese. Add bean mixture on top of the salad base. Then layer again. Serve with a side of salsa and greek yogurt (or sour cream). It feels kind of silly to write out a recipe for taco salad, but the bean mixture is more what needs directions. This was really tasty. The aduki beans added a nice contrast to the black beans. I sliced the jalopenos with gloves so that I wouldn’t get the oils on my fingers. I’ve heard too many horror stories and I just didn’t want to risk it! This recipe made enough for two large salads (each salad had two layers) and there’s still left overs. I’m excited for a delicious lunch tomorrow! Play around with the seasonings. I used the chipotle chili powder because it’s spicier than regular chili powder. I also used hot salsa to add some heat. If you like it spicier you could add more or use more jalopenos. If you like it milder just play it safe with the spices (i.e. 1/4 tsp) and adjust as necessary. 🙂 I hope you enjoy this!